Asian Art Museum , 9780939117765, 288pp. This collection by the Asian Art Museum is a selection of works depicting the ancient Rama Epic. The Rama Epic—recounting the struggle of Prince Rama to defeat a demonic king, rescue his abducted wife, and reestablish order in the world—has been a subject for visual and performing arts, literature, and religious thought in the Indian subcontinent and Southeast Asia for many centuries. A huge number of artworks relating to the Rama legends have been made over the course of 1500 years in a dozen countries. 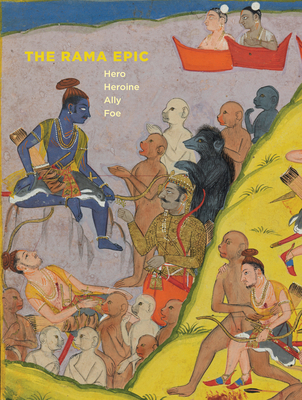 The Rama Epic: Hero, Heroine, Ally, Foe illustrates some of the most important episodes involving the four primary characters: the hero, Rama; the heroine, Rama's wife Sita; the ally, Rama's faithful monkey lieutenant Hanuman; and the foe, the ten-headed demon king Ravana. Edited by Forrest McGill, Wattis Senior Curator of South and Southeast Asian Art at the Asian Art Museum of San Francisco. Dr. McGill has worked for over thirty years as a museum administrator and curator, professor, and researcher in Asian art. Introduction by Pika Ghosh, associate professor of art history at the University of North Carolina. Essay by Robert P. Goldman, professor of Sanskrit and Catherine and William L. Magistretti distinguished professor in South and Southeast Asian studies at UC Berkeley. Essay by Sally J. Sutherland Goldman, senior lecturer in the department of South and Southeast Asian studies at UC Berkeley. Essay by Philip Lutgendorf, professor of Hindi and modern Indian studies at the University of Iowa.